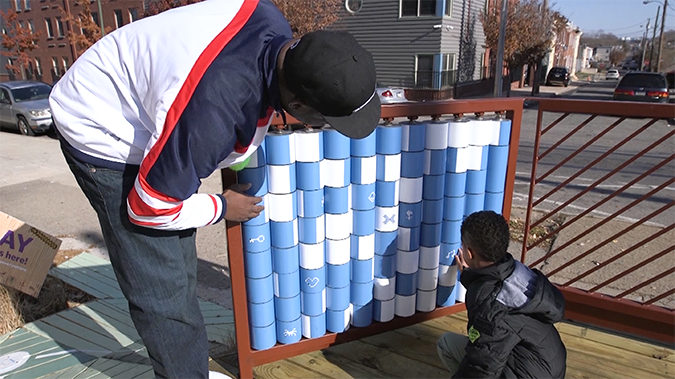 Urban Thinkscape transforms public spaces in neighborhoods into opportunities for playful learning by infusing them with durable, replicable, and attractive activities that challenge the mind while encouraging caregiver-child interactions. Puzzles at bus stops stimulate spatial skills; movable parts on park benches become opportunities for exploring language, color, and numbers; and on-site signage and a website connect caregivers to additional information and resources about the links between play and learning. There is a science-based connection between play and learning. Play helps children develop academic skills. Playful learning can occur in everyday interactions between adults and children. The program brings together architects, psychologists, city planners, local civic associations, and community members to reimagine and design neighborhood spaces and structures that promote the development of spatial, language, and socioemotional skills. Urban Thinkscape has piloted its program in the Belmont neighborhood of West Philadelphia, Pennsylvania. Children spend significant amounts of time outside of school, and yet public investment in learning is often confined to school property. Communities haven’t traditionally considered the places where everyday interactions between parents and children take place—bus stops, the corner market, sidewalks—as locations for supporting learning and as opportunities to strengthen their investments in public education. View this feature on Urban Thinkscape from Quartz. At the same time, a typical day for most families is extremely busy. Adults need to get to and from work; shuttle kids to childcare, school, and after-school activities; feed loved ones; pay the bills—the list can feel endless. In the midst of all of this activity, parents and caregivers may miss opportunities for simple, back-and-forth interaction and playful learning with the children in their lives. Yet those interactions and experiences are so important for setting up children for success in learning. Everyday moments—like waiting for a bus or going to the store—can be perfect opportunities for children and adults to play, talk, and interact together, all of which build future academic and life skills. Urban Thinkscape aims to transform learning outcomes for children (preschool through elementary-age) by changing existing public spaces to create environments that encourage playful learning and interaction among children, parents, and caregivers—in the neighborhoods where they live. Families will be more engaged and interactive with the public space. Caregiver-child discourse around public spaces will be increased in ways that create hotspots for learning and enhanced family interaction. Families will begin to understand and change their attitudes regarding the links between play and learning and the utility of everyday environments for fostering children’s learning. Belmont residents work on part of the puzzle wall together. Children will improve their skills (play, socioemotional, language, and math), be better prepared for school, and reach greater achievements in school. Parents and caregivers will have a better understanding of and appreciation for play as a form of learning. Communication and interaction between children and caregivers will increase. The Urban Thinkscape team worked closely with the Frontiers of Innovation (FOI) leadership team as they developed their theory of change. Using the IDEAS Impact Framework, the Urban Thinkscape team was encouraged to examine their implicit assumptions about the program’s value and to get very specific about both the short- and long-term outcomes they wanted to achieve. This helped them identify and map out how they would measure the effects of the program. For example, how would measuring caregiver-child engagement and attitudes about play translate into increased school readiness? In the true spirit of sharing and innovation within FOI, Urban Thinkscape also contributed to FOI’s understanding and measurement of community engagement. The program’s unique and strong focus on community challenged FOI leaders to think about what measures should look like in community settings. At the heart of the Urban Thinkscape intervention is co-creation—working hand in hand with the local community to develop and implement the intervention. From selecting a neighborhood and lot, to reviewing and choosing designs, to installation, to measurement and evaluation, Urban Thinkscape has sought out community members and involved them in every aspect of the program. In the design phase, Urban Thinkscape conducted community focus groups and consulted with the city before selecting the Belmont neighborhood in West Philadelphia. The neighborhood’s Belmont Alliance Civic Association was an essential partner throughout the entire process. The project site, a lot located at 4001 Lancaster Avenue, where Martin Luther King, Jr. spoke to 10,000 Philadelphia residents in August 1965, was graciously made available by Community Bible Deliverance Kingdom Ministries. The corner lot was also home to an active transit bus stop, which meant residents of all ages could access the project while waiting for a bus. After securing the site, Urban Thinkscape worked with an architectural consultant to develop sketches of potential designs and shared these at neighborhood meetings and with a collaborative, interdisciplinary group of researchers. From there, four designs were selected and eventually built for the site, creating a cluster of interactive installations. BEFORE: See the original project site. Click and drag to see the 360-degree video view. AFTER: See the completed Urban Thinkscape installation. Click and drag to see the 360-degree video view. Puzzle Wall – The back wall of the bus stop is a puzzle with vivid neighborhood-focused designs. Waiting caregivers and children can work together to turn the pieces and complete the puzzle, while strengthening math and spatial skills. Jumping Feet – Stepping stones with shoe prints encourage kids to jump, while the changing pattern develops their ability to control impulses by making them think about their next step. Hidden Figures – A bright blue metalwork sculpture inspires curiosity and builds problem-solving skills as children and caregivers search together for images of food, animals, and other objects within the design. Kids can also develop spatial skills by figuring out how the images are projected onto the ground. Stories – Wooden ramps and peaks with painted narrative cues encourage children to physically move from one cue to another while making up their own story. This activity helps kids (and caregivers) build their narrative and reading skills. The Urban Thinkscape team also developed signage and a website to provide more information about the designs and the skills they are designed to build. After six months of construction, the community grand opening for the Urban Thinkscape installation was held in September 2017. To understand the impact of the Urban Thinkscape pilot on children and caregivers, the Urban Thinkscape team trained community members in data-gathering, observation, and surveying techniques. Before, during, and after the building phase of the project, this extended research team observed the types of interactions between children and caregivers at the site and surveyed caregivers to understand their beliefs and attitudes about play and learning. Community involvement is critical to success. And, the earlier the community is involved, the better. Urban Thinkscape brought in Belmont community members from the very beginning and relied on their input and feedback during the entire design and construction process. After installation, community members worked to collect data and to evaluate the impact of the project on the neighborhood. Find a community partner and advocate. Success for Urban Thinkscape hinged on partnering with a strong community group who advocated for the project from start to finish. For the pilot, that group was the Belmont Alliance Civic Association and their leader Bettye Ferguson. Urban Thinkscape increases interaction and engagement in public spaces. Results showed that adults and children engaged in more conversations and were more interactive overall, even in comparison to a neighborhood playground, once the Urban Thinkscape designs were installed at the bus stop and adjacent lot. The team is also continuing to gather and examine data about caregiver understanding of the importance of play and its relation to learning. A young girl tries out the Jumping Feet design. The Urban Thinkscape program is led by Kathy Hirsh-Pasek, Ph.D., (Temple University & Brookings Institution), Roberta Michnick Golinkoff, Ph.D., (University of Delaware), and Brenna Hassinger-Das, Ph.D., (Pace University). Itai Palti was the architectural consultant. The following partners worked together on the Belmont neighborhood installation of Urban Thinkscape.